I do follow the work being done by the San Diego River Park Foundation, but perhaps I can offer some personal experience in restoration techniques for which I have done before in Riparian restoration. 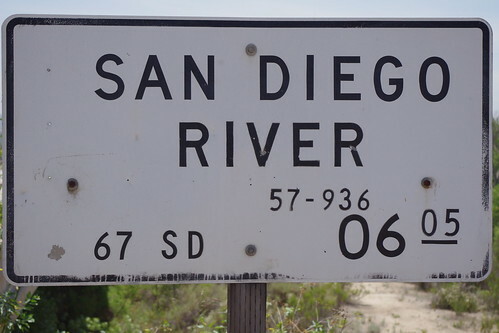 This sign below is where I have on example seen my trip the chocking of invasive plants like Tamarisk in places like the San Diego River in Lakeside California. Although I must say that I have neither heard nor read about any programs to eradicate this riparian habitat menace. I've previously written about this plant Here , but I in no way blame it for the problems facing southwestern ecosystems problems. I put it squarely on the shoulders of those responsible for the present fiasco, humankind. 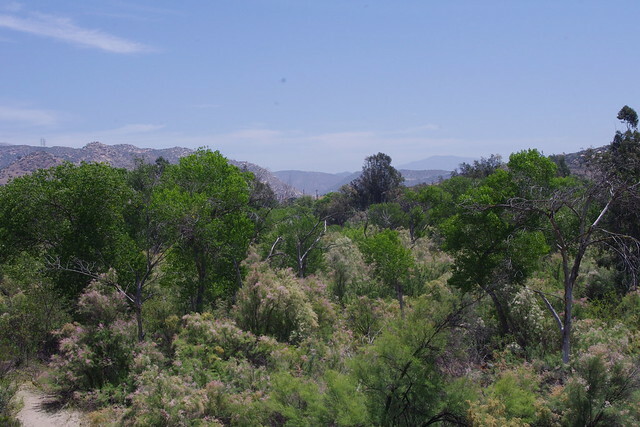 On my stay for two months in Southern California, almost every single riparian area I crossed over on a bridge somewhere whether it was the San Diego River, Sweetwater River, Santa Ysabel Creek, San Luis Rey River, etc,etc, etc & almost every single waterway period, had areas choked by the invasive North African/Middle-Eastern tree we call Tamarisk (Salt Cedar) which was the unfortunate & ignorantly brought over as a Desert Windbreak tree and not just one variety, but several which now have infested just about everywhere in all the southwestern United States. What I should have done is include all these pictures in with my post on Climate Change, Warming, Shifting ???? which dealt with the native tree Palo Verde's movement into coastal chaparral plant community and California Sycamore tree successes at higher elevations where they formerly had remained stunted at best as a result of late cold snaps, but clearly have started to succeed with the climate changes. 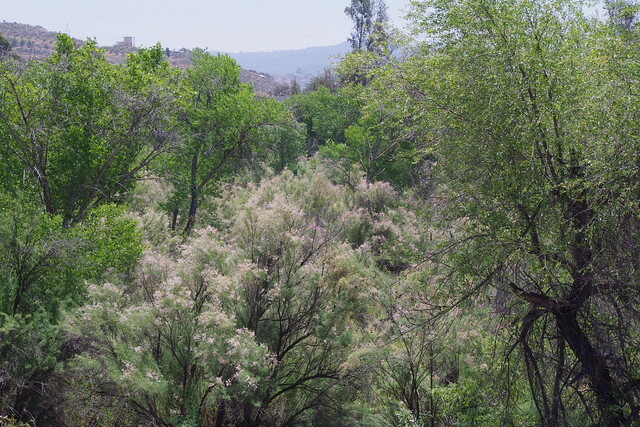 The two trees are native and I have no issues with these improvements, but Tamarisk successes where I had not seen them as prolific before, although present in the past, do pose a more serious problem. 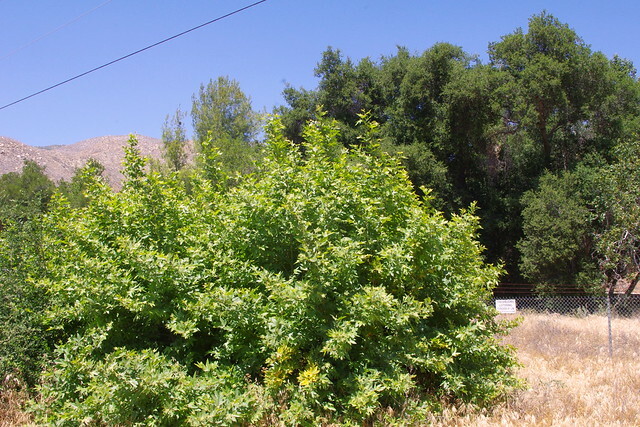 Below are some photos which expose the real problem of this invasive plant which crowds out Cottonwoods, Sycamores, Willows, Velvet Ash, Mexican Elderberry and possible Oaks along the outer fringes of riverside bordering. 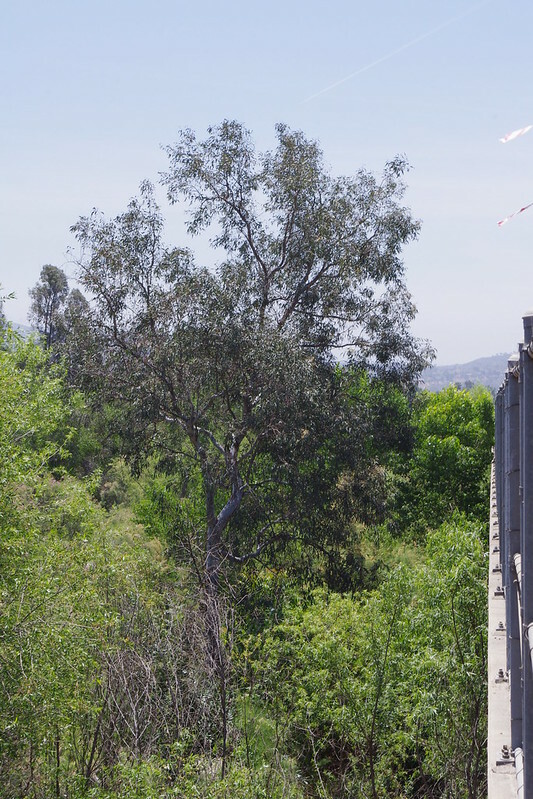 I actually have seen from even Satellite photo imagery these invasive trees all along the entire San Diego River. Another major invasive in many hydrological channels in coastal San Diego County and even with the city limits where rain run-off channels utilize existing washes are the Baja Native, Mexican Fan Palm (Washingtomia robusta). Maybe I wouldn't be so sensitive against these had the been California Fan Palm (Washingtonia filifera). Both of the above photos are of the view from the Hwy 67 bridge in Lakeside California looking eastward towards El Capitan High School and the El Monte Valley beyond. 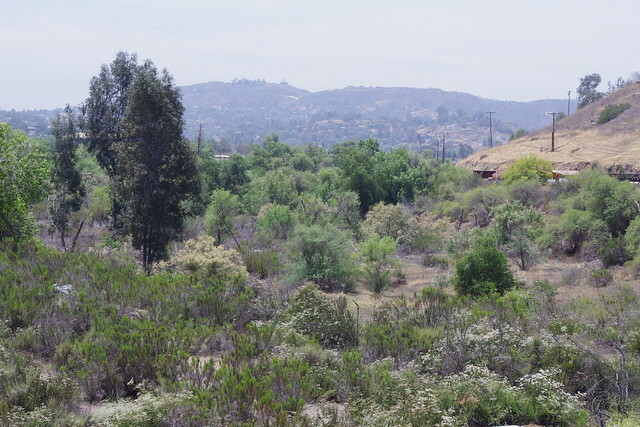 The Tamarisks are very heavily growing even on the the east side of Ashwood St where it crosses the San Diego River and before it turns into Wildcat Canyon Road. Looking west towards the direction of Santee California from the Hwy 67 bridge in Lakeside California. Mostly we are looking towards Cowles Mountain way off i the distance, but also the backside of Rattlesnake Mountain over on the left side of the photo. Also, timing of eradication would have to coincide with Seed dispersal which fortunately has only a small window of viability for germination to be successful. (I believe no more than 30 days) This could actually be an advantage. 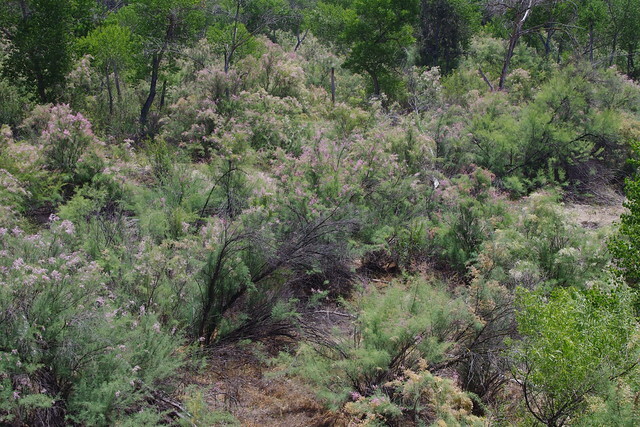 The other problem I see with Tamarisk woodland thickets which crowd out riparian natives is that from what I have observed, they are a greater mega-fire risk than pure riparian species which often act as a fire barrier and if nothing else at least slow an advancing fire down as far as it's rapid progress. Anyone who has ever witnessed a Tamarisk woodland burn knows that it burns with an intensity generally associated with Chaparral. This makes for another reason it needs to be completely eradicated. Mechanical removal and possibly burning the stumps out through a charcoal method in wintertime when they are dormant may be the only way. But you cannot leave any live roots which will re-sprout. I would definitely forbid the use of chemical treatments with products like Roundup which already contain warnings for usage in and around Riparian areas anyway. The root systems easily sprout back as they do when fire pushes through an area, so it is imperative to destroy as much of that infrastructure as possible. Other trees like removal of Eucalyptus and Fan Palms would be a no brainer. However, once removal is completed, there must be a rapid rush towards replacement with native species and quickly. This is where proper planning and acquisition of 1000s of various plants would have to be on the ready. Now take a look below at some places where specimens could be obtained. These suckering aggressive sprouts are of California Sycamore on the north side of California State Route 74 leaving Hemet towards Idyllwild. The Power Utility Edison has been battling with these poor trees for decades. 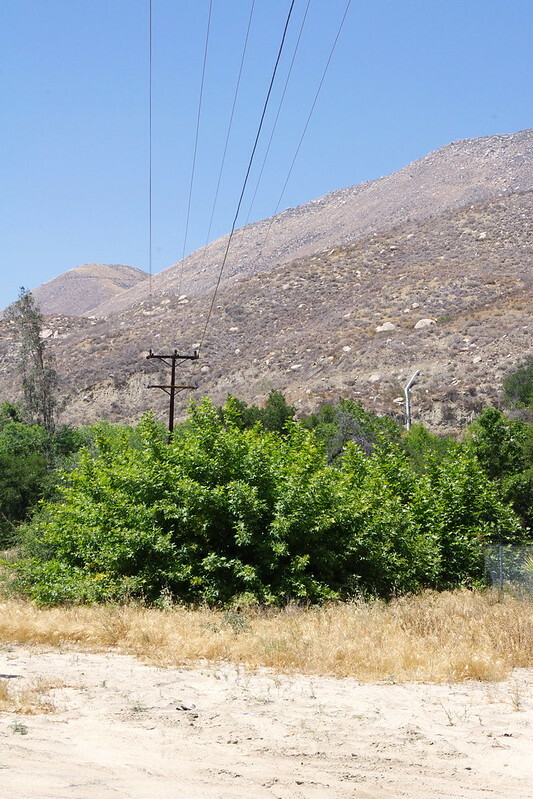 In the early days, these two specific trees still had large trunks and were topped off just under the power lines, but passing by a few weeks back I noticed they were aggressively dealt a heavier blow all the way to the ground. So every year thereafter, the maintenance crews come along and butcher these poor trees in the Chop Shop fashion of many a commercial Tree Butchering company who are subcontracted to do nothing more than remove living vegetation away from anything utility. There is no care given to aesthetics, it's strictly what's necessary only business. I could name the well known companies, but you folks out there already know who they are. There is a chain link fence next to these trees with a Utility Maintenance gate. This location along the Route 74 is where the North Fork of the San Jacinto River merges with the main channel of the San Jacinto River canyon. The South Fork canyon and branch is further east up the road. The first time I saw the utility company severely top the original trees, I remember months later while passing along this spot and seeing the luxuriant growth fighting to come back with a vengeance, what great cane pole specimens they would make for transplantation out directly into an area for rapid riparian recovery. Well now it looks as if this task just got a lot easier. Look at all those prized cane pole examples. Are you taking notes Robert Hutsel and Jim Platel ? Remember that location on Hwy 74 east of Hemet CA ? Hey, I'm serious! Cutting inch to two inch poles for planting which is merely harvesting extremely long poles, can be a major head start of sorts if done correctly and babied with care that first year or two. Sycamores, like Willows and Cottonwoods have an amazing propagation adaptation which allows a branch to be broken off during high flood periods and become buried way down stream only to re-sprout a new tree somewhere else. They have a high growth hormonal content within their tissues. Some folks even make a tincture of willow bark as a natural rooting hormone for other unrelated plant cuttings for their gardens. While excessively large cane poles which may even require a boring agar with tractor may seem extreme overkill, I believe such techniques will become more and more necessary as time and deterioration of various ecosystems picks up the pace. If the present failed System of Things persists for very long, Mankind will become more and more forced into desperate & dire circumstances where such major forcing techniques will become necessary to accomplish things they should have done decades ago. 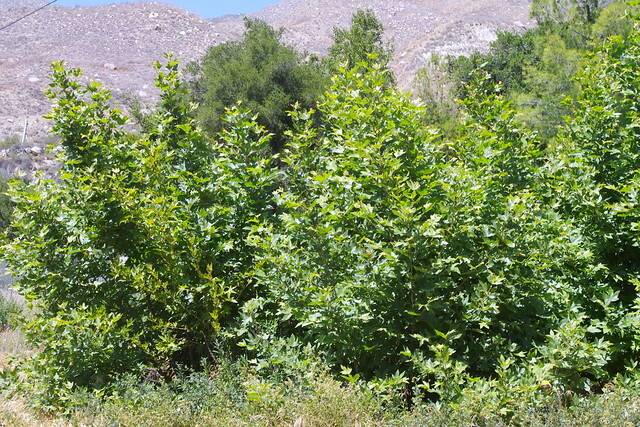 One such rapid riparian establishment technique is being used in Arizona with both the Fremont Cottonwood (Populus fremontii) and Arizona Sycamore (Platanus wrightii) where surface water is 7 to 15 foot below the surface in dry washes, but which have a moist subsoil layer. They do recommend to cutting 20 foot cane poles, pre-soaking in water and planting at least two thirds of the pole in the deep drilled planting holes. Again, this may sound extreme, but the extreme countermeasures must be forced for a rapid repair of long ago destroyed former riparian habitats. Here's a link to some of the recommendations given by some government agencies. "Plants may be propagated either by seed germination (see section on Germination Requirements) or by cuttings. The greatest results for cuttings are from one year old vigorously growing seedlings, for which there is a 66-80% success rate (Fowells 1965). Fowells (1965) suggests fall plantings of cuttings made close to the root collar that are 20 inches (50.8 cm) long, buried 15 inches (38.1 cm) into the ground. 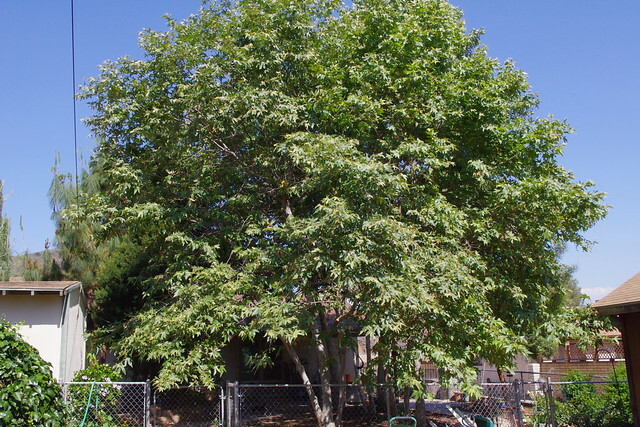 For areas in Arizona where groundwater is 7-12 feet (2-4 meters) below the surface, a new method of propagation has been tried that might be successful with Arizona Sycamore. Twenty foot (6 meter) long poles were planted in drilled holes with 4-6 feet (1.2-1.8 meters) extending above the ground, leaving 14-16 feet (4.3-4.8 meters) below ground and penetrating into the groundwater. Poles were 2-3 inches (5-8 centimeters) in diameter. They showed a greater chance of survival if a portion of the poles were in saturated soils year around (Swenson and Mullins 1985)". Some of the studies recommend applying a slow release fertilizer, but there is no way on earth now that I would recommend such a measure. Riparian habitats for the most part are extremely nutrient rich anyway as a result of flooding and silting from upstream higher elevation runoffs every year for 1000s of years, so nutrients are not an issue. However, I would definitely inoculate the pole cuttings at time of planting with a good blended mycorrhizal mix containing both Endo & Ecto mycorrhizal fungi. 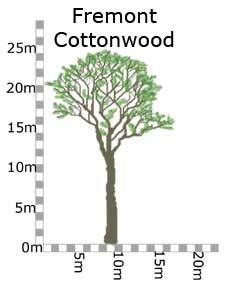 Many people still don't realize that riparian species like willows, alders and cottonwoods are actually both endo & ecto mycorrhizal. Sycamores are strictly endo mycorrhizal as I believe. Root growth potential no doubt will be rapid and healthy as long as plenty of water is maintained to replicate wild heavy rainfall cycling periods which are foremost in major establishment of riparian woodlands, especially those in areas which will later be dry with no surface running water other than underground water flow movement. These trees below here are two years old California Sycamores first planted in 2005 and this photo is 2007. They were planted from one gallon nursery pots purchased from Las Pilitas Native Plant Nursery and also inoculated with the proper mycorrhizal mix (MycoApply) from Mycorrhizal Applications Inc. I never leave anything to chance by making the blind faith mistaken assumption that the fungal spores are just out there everywhere present in the air. I don't take that chance and neither should you landscapers or habitat restorationists. Same are those same California Sycamore trees in May 2011 four years later. No further watering was required after 2007 and today they are monstrous. Watering is still absent, other than yearly seasonal rainfall. However you should know that my mother's property is location on an ancient alluvial fan at the foot of Rattlesnake Mountain in El Cajon and has a water table with good moisture availability about perhaps six meters down or about 15' to 20' down which is easily accessable to deep rooting Sycamores, The soil is beautiful sandy loam all the way down. And these are the same trees viewing from behind the small house on the left which was viewed from the front in the top two photos. This was taken on April 2013 this year. It illustrates the potential for dry barren riparian woodland habitats which have underground water close to the surface. These no longer receive water other than season rainfall. With all the Cal-Fire money being loaded into worthless prescribed burning programs which scientifically offer no real lasting solutions and only exacerbates the problem along with habitat destruction for both plants and wildlife, one would think these funds could be more constructively utilized in worthwhile lasting ventures like Tamarisk Removal and Native Riparian Tree Species being reintroduced into formerly healthy hydrological systems. Even a labor force of Folks on Government assistance (welfare) who unfortunately having been on such programs for years or even decades and have no feeling of purpose or self-worth, could be greatly benefited and be paid for it. Nothing gives purpose more than worthwhile healthy surroundings like restoring things in the Natural world. And I'm not talking forced menial labor. Such attitude about physical work is merely flawed thinking. As I've stated in the past in establishing landscapes in cities or in the wild, a welfare system of handouts is a failed program. Offering a healthy hand up is entirely different and helps establish an independence in both humans and Nature. Same goes with plant establishment, don't welfare your yard on a permanent irrigation system. Wean them off the initial life-support irrigation system handout and allow them to grow & search for themselves with only minimal offering during harsh times until fully established. Works every single time. Only time will tell if the present human leadership will actually get a clue, but their window of opportunity at proving mankind does indeed have the answers towards proper Earth custodianship is rapidly disappearing. I'm seeing more and more tamarisk in Reed Valley. What's Killing the Evergreens in Sweden ? Climate Change, Warming, Shifting ??? ?